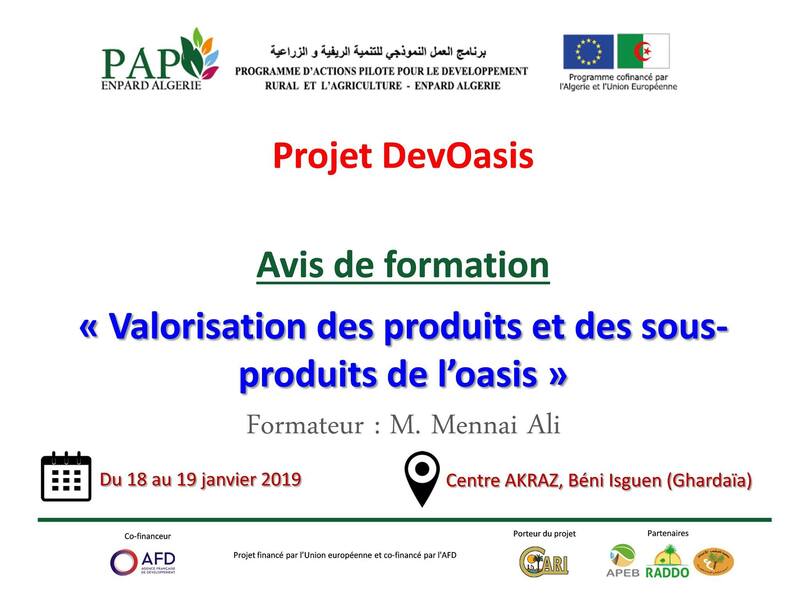 In the framework of the EU-funded project “Support to local actors for the sustainable local development of the Southern Algerian oases”, APEB (the Association for the protection of the environment of Beni Isguen) is organising a training session on the promotion of the products and by-products from the oasis. This event will take place on 18-19 January in Beni Isguen, in the province of Ghardaia, Algeria. The objective of this project is to promote the sustainable rural development of the Southern Algerian oases through the building capacities of the actors of the oasis civil society and their networking, as well as the support to the development of agricultural production sectors in view of contributing to the economic development of these regions. This project falls also within the framework of RADDO, the network for the sustainable development of the oasis ecosystems.